When someone opens up the door and steps into your vehicle, one of the first things they will see is the head unit of your stereo system. As such, those who want to impress others should consider not just the functionality but also the look and feel of their stereo system. For those who may not know what a “head unit” is, that is just the technical term for the main component of your car stereo. When you want to put your best foot forward, a slick and large head unit can go a long way. 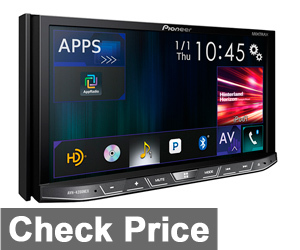 This is why double-din head units have become more popular in recent years. To explain this terminology, “din” simply refers to a size standard. Single-din stereos are short, measuring about 7×2 inches in most cases. A double-din stereo is about the same length, but about twice as tall at 7×4. There are a few specialty sizes, but most car stereo head units are either single-din or double-din. These units deliver a superior interface that makes it easier to control the function of your stereo system as you drive. Most touch-screen car stereos are double-din, as there is a lot more room for icons and menus. Aside from the superior interface, a double-din unit will also have a little more room inside of it, allowing a greater number of features to be present. 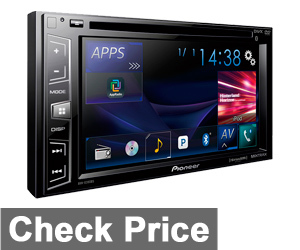 Although they tend to be more expensive, double-din stereo systems are usually superior. With that in mind, we present our top 9 double-din head units. This multimedia stereo system offers a large array of features and good compatibility with common mobile devices and services. It has a 6.2-inch WVGA display with a nice bright LED backlight. Even on the darkest nights, the display is easy to read. This unit also has built-in Bluetooth capability so that you can connect all your mobile devices. This means that you can use external speakers without having to do any wiring or complex assembly. It also means that you can control the entire thing from your phone, and the unit is set up to be used in this way. The unit also comes equipped for streaming radio content like SiriusXM. It can be controlled with an Android phone or an iPhone. It can also make use of Apple Carplay, which is a standard feature on most iPhones. Apple Carplay allows you to control your phone through the display in your head unit. Basically, it just transfers your home screen to your unit display. 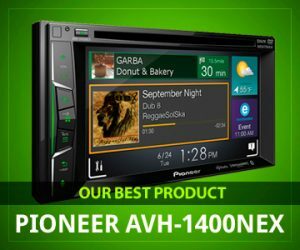 The Pioneer AVH-1400NEX is also made to accept a DVD input, although an additional accessory is required to utilize this feature. It is also able to accept the input from a backup camera, which is actually the best idea if you are concerned about safety. The Sony XAV stands out in the fact that it seems so simple. Rather than having a complex array of buttons and dials, this unit just has three buttons and a dial. Of course, the touchscreen opens up a lot of other options, but the lack of external controls is a plus because it accommodates a 6.4-inch screen which can be switched out for a full 7-inch screen if you so desire. This stereo gets good and loud, all the way up to 18 decibels. Of course, speakers and amplifiers can make it even louder if you are into that sort of thing. This one is a little more expensive, as Sony products often are, but the quality is there, and Sony is a trusted name for many kinds of electronics. The unit is capable of Bluetooth connectivity out of the box and is also satellite radio-ready. 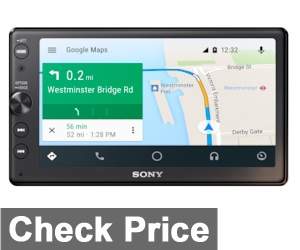 Like most of our choices on this list, the Sony XAV can be connected with an Android or iPhone via a USB cable, and it is equipped with Apple Carplay. The AVH also has a separate channel and separate controls for a subwoofer, which is really nice. There are a lot of features here, and it connects easily to mobile devices and external drives using USB or Bluetooth. That being said, there are a few flaws here. Many people have reported problems with updating the firmware, and problems with Bluetooth connections frequently dropping. Many reviews seem to indicate that this product can be buggy, so use your best judgment and try it before you buy it. This one seems like more of a budget option, and it seems like a decent one. At first glance, one can’t help but notice how much it resembles a smartphone. With a 6.8-inch screen, this unit has one of the biggest we have seen. Of course, the price of this is that the external buttons will be small and located only around the outside of the unit. The tiny buttons might irritate you, but that’s usually the price you pay if you want a big screen. Thankfully, they still managed to find room for a USB slot and a slot for a micro SD card. Dual Bluetooth chips give it better reliability than most, and the unit can be controlled from Android or iPhone. In fact, the unit runs on a version of Android OS, so there should be no compatibility issues with Android phones. This thing even has a built-in amplifier. That being said, this system doesn’t really deliver a high level of volume, so those who are looking for a big thump might do well to avoid this one. The system also has a relatively long startup time, which is another small annoyance. A decent number of reviews say that this company is not very responsive. This might very well be the most traditional-looking choice on our list. Many things about it are reminiscent of the boxy old car stereos that used to be so common. However, this is obviously a lot better than the radio from grandpa’s old Cadillac. 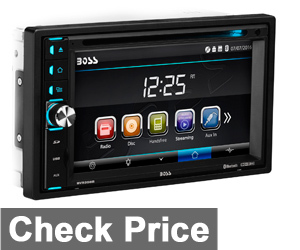 Boss is a pretty well-trusted name when it comes to sound, which speaks well for this product. The screen is 6.2 inches and features a nice large time display combined with a simple interface consisting of minimal buttons. This might be a good choice for older people who don’t want to bother with high-tech devices. It has a traditional volume knob and large buttons with clear labeling. This is the most inexpensive unit we have looked at so far, which is odd when you consider the features. It has a single drive that can play CD’s or DVD’s, it takes both USB and SD cards, and can even be set up with your phone to provide hands-free calling. When we look at the reviews, we can see a large percentage of bad comments. Opinions on this model seem to be divided roughly in half, with about half saying that it’s a great value, and the other half saying that it’s a piece of junk. Some of the more common complaints include poor FM radio reception, a serious lack of good installation instructions, poor volume control (going from too quiet to too loud with no happy medium), and random screen glitches. To be fair to the company, we should mention that the 3-year warranty includes free repairs. This one also seems to have been designed with tradition in mind, though it will definitely cost you a lot more than the Boss model. The volume knob is sleek and shiny, and provides pretty precise adjustment without needing to look away from the road. Other than the knob, this thing has very few external controls, as the touchscreen makes them somewhat unnecessary. The screen is 6.2 inches and has a backlight that really makes it stand out. It is advertised as a high-resolution screen, and it really shows in the sharp detail of the picture quality. One benefit of this unit is that it is set up for easy audio and video streaming from a variety of service providers. Unlike many of these units, this one can be hooked up via HDMI to an external screen. It plays both CDs and DVDs, and Bluetooth functionality adds more options to the table. The built-in navigation system certainly doesn’t hurt either. As for power, this thing peaks out at 160 watts, so it should be adequate for even large and powerful sound systems. I also like the fact that you can change the color of the LED lights to fit the interior of your car. That being said, every type of product will have a few defects, and this product has gotten mostly positive reviews. 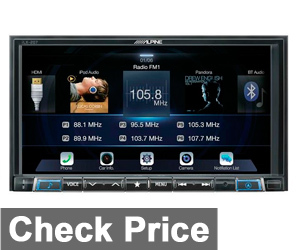 This is a high-end head unit that comes at a high price, but delivers a high level of quality. I have been unable to find a single negative review of this product, but its cost is more than double the price of most of our other models. The iLX has a full 7-inch screen, meaning that nearly the entire front surface is a screen. It has a few external buttons at the bottom, and they are laid out in a way that is easy to understand. It can be very irritating when your stereo system is ridiculously difficult to configure, so it’s good that the company has avoided this issue. Of course, most of the controls are found on the touchscreen, and they are very well-organized. 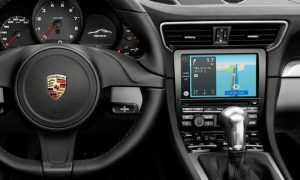 As you might imagine, this one has plenty of features like Bluetooth, Apple Carplay, Android Auto, and complete integration with most mobile phones. You can hook your phone to this and use it to do anything your phone can normally do. By using Siri, all of these functions can be used with voice commands. This is very good in terms of driver safety. Many people die in vehicle accidents as a result of being distracted by a phone, and anything that can reduce the chances of that is worth having. The iLX also has an HDMI output for any larger screens that you may wish to use. Screen resolution comes in at 800×400, providing excellent clarity and sharpness. This one is generally a little harder to install, so it is recommended that you have a professional do the job. DDX416BT has a very basic and functional design, which results in a reliable and well-rounded product. It has a 6.2-inch screen and only a few external buttons on the driver’s side. The unit is compatible with iPhones, iPods, Android phones, and more. Like the high-end Alpine model, it is equipped with Siri so that it can operate partially or entirely on voice commands if you choose. It can connect to mobile devices using cables or bluetooth, and does a good job for both. Another plus about this product is its simple menu screen which is easier to navigate than most. This unit has four channels and plenty of power, making it fairly easy to connect with amps and subs and set the system up accordingly. Complaints about this model are not particularly common, as it generally gets good reviews. However, common complaints include inferior Bluetooth connectivity. Some users say that the unit will fail to connect to devices far too often, and these complaints seem to be pretty frequent. Some others say that the unit has an inferior picture and sound quality, but that could simply be a few defects. Screen resolution on this unit is not incredibly high, but it is good enough to do the job. Many users say that the DVD picture quality is less than great, but this isn’t really a huge problem. This is another large-screen model, with a 7-inch WVGA display that is second to none. The shape and contour of this one is very pleasing, and its external buttons are conveniently located and easy to locate by touch thanks to the small protuding ridge at the bottom. Like the Alpine, this is a premium product for premium buyers. Like the Alpine, it will set you back significantly. With 50 watts and four channels, this one is more than up to the task of powering a serious sound system. With Android Auto and Apple Carplay, it can integrate with nearly any mobile device and comes with several accessories. One of these is a remote control that can be mounted to any place in your vehicle so that you or a passenger can adjust the music or temperature at will. One thing I like about the AVH-4201NEX is the fact that it displays temperature information almost as prominently as the time, letting you know when or if you need to adjust the climate controls. Overall, reviews for this product are pretty good, although a few people have reported defects, unexplained breakage, and other inconveniences. 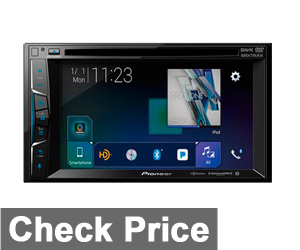 However, this product seems to be pretty well-liked, and could rightly be considered to be Pioneer’s “flagship” head unit. Now, let’s take a quick look at the things that should drive your choice when you begin the process of finding your ideal head unit. First of all, let’s talk about the difference between a single-din stereo and a double-din stereo. 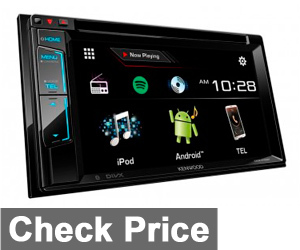 The main difference, as far as you are concerned, is that a single-din stereo can only be replaced with another single-din stereo, while a double-din stereo can be replaced with either a single-din or double-din unit. This means that some vehicles are simply not compatible with double-din dislays, and you should try to figure out if your vehicle fits this category before you go any further. 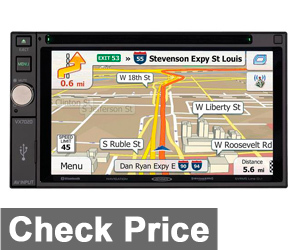 Most car stereos will have a list of vehicles that are compatible or incompatible, so do your research. When it comes to power, you can look at the wattage that your unit is capable of producing. If you don’t like your music to be very loud, this won’t be a big concern for you, but if you are the kind of person who likes to rattle all the windows in the neighborhood, this will matter quite a bit. Check your hardware and make sure that your unit is compatible. Screen size is another thing to consider. Obviously, a larger screen is preferable, but bear in mind that these units conform to a more or less standard size of 7×2 inches. This means that a larger screen comes at a cost. When you use all of the surface space for a big screen, there is much less room for things like external buttons, volume knobs, and USB ports. Consider where you store your music. Do you store it on your phone? Maybe on a USB flash drive? Wherever you store your tunes, make sure that your stereo can read your preferred format and read it reliably. Consider whether or not you want to use Bluetooth, and make your decision accordingly. Hands-free operation is something that will be important to many people because it can grant an improved level of safety. This is the case because a person can talk on the phone without using their hands or taking their eyes from the road. If you are the kind of person who is prone to texting and driving, this kind of feature might actually save your life. Ease of use is another issue to be considered. This is an object that will often be controlled with one hand as you drive with the other. You can’t take your eyes off the road for more than an instant or two, so you need to be able to work the unit without taking your eyes from the road. As stated, voice controls are one of the best methods of getting around this issue. However, you should still try to select a stereo that can be operated easily and navigated by touch rather than sight. We sincerely hope that this guide has been helpful to you. 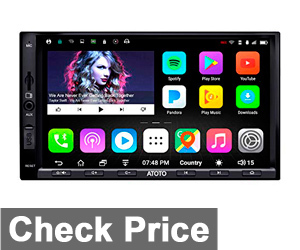 Obviously, we cannot make your decision for you, but hopefully, we have informed you a little better so that you can make an intelligent decision in your choice of a double-din head unit.